A similar list appears in Macalister’s Ireland in Pre-Celtic Times, which mentions Corcu Bibuir ‘beaver people’, Corcu Cuilend ‘puppy people’, Corcu Oirce ‘pig people’, Corcu Tened, ‘fire people’; Bibraige ‘beaver people’, Boccraige ‘goat people’, Breccrige ‘trout people’, Cattraige ‘cat people’, Cechtrige ‘plough people’, and Cnamrige ‘bone people’. According to Macalister, totemism existed in Ireland “as elsewhere in antiquity”, and he says “the grotesque story that the mother of Oisín the poet was a deer can best be explained by supposing that she belonged to a fawn kindred”. Perhaps; metamorphosis is rife in myth in any case. Oisín, incidentally, means ‘little deer’ or ‘young deer’. the bear and the boar were the kings of the forest, whereas the wolf and the raven were the close companions of the god Odin. These four creatures figured prominently in personal names throughout Western Europe for many centuries after the Heroic Age. All these [peoples], when the genealogists got to work in the comparatively Christian atmosphere of the seventh century, were endowed, or endowed themselves, with ancestors whose names included the first elements of their names, or had an etymological explanation provided for them, as with the Cerdraige, of whom it was alleged that every man was a craftsman (cerd). It seems indisputable, however, that one element in these names is in fact the name or epithet of a divinity which that people had in common – ‘the god by whom my people swear’, as the law-texts put it. One such people, the Boandraige, have as the first element of their name that of the goddess Boand, who elsewhere appears as the divinised river Boyne; another, the Luigne, contains the name of the god Lug. Whether such a divinity was regarded as being also an ancestor, which would make easier their transformation by the genealogists, is not clear. This is not a subject I’ve ever studied in depth, but I find it interesting. Many contemporary surnames are occupational names long divorced from direct implication of a vocation or avocation, or they retain some other form of fossilised cultural meaning. The connection may no longer hold but the name preserves a tenuous link with the remote past. This entry was posted on Tuesday, October 30th, 2012 at 9:15 pm and is filed under books, etymology, Ireland, language, language history, naming. You can follow any responses to this entry through the RSS 2.0 feed. You can leave a response, or trackback from your own site. That’s really fascinating. Will have to look for MacNiocaill’s book, perhaps in the library. Eimear: I thought so too. Mac Niocaill’s book is mostly concerned with political history up the the end of the 8th century: who ruled where, and what was the order of succession. This doesn’t interest me particularly, but I enjoyed his other observations. Garrett: Quite possibly, if you mean worldwide or in the U.S. But I’d say there are more significant factors than assertion of independence. In Ireland, sadly, there seems to be “a drift away from Gaelic names”, according to an Irish Times article reporting on recent statistics. All the old stories include totemic references and tabu – the Fíanna (deer herd) were led by Fionn, whose original name, Deimhne, meant a young stag; his son and grandson were Oisín and Oscar – both names for fawns; and his wife was Sadhbh, which means a doe. He also had hound tabus; two of his cousins were the dogs Bran and Sgeolang, etc. Cúchullain was the hound of Cullen, and he had a tabu about eating the shoulder of a boar, and another never to refuse an invitation to eat; when these two clashed he met his death, at the behest of the raven goddess he had offended. As for the drift away from Gaelic names, they ebb and flow. Béidh siad ar ais! Marvellous stuff, Stan, must get the book. Names (not just Irish) fascinate me, particularly here where minor distinctions are made as to heritage – Daly, Daley. And distortions – Moore, Moores, Sancrey, St. Croix. I find the younger generation (my many nieces all in their twenties) are no longer bestowing Irish names on their babies but all moving to Hollywoodizations. Madisons rule. Sinabhfuil: Thanks for that fine account. Yes, the old stories are full of them. And I’m sure you’re right about the names. Shaun: It is fascinating for sure. WWW: The small distinctions can be as telling in their way as the surprising similarities. Fashion and aspiration seem to play a large part in naming; let’s hope Irish ones return to vogue before long. Perusing the CSO list of baby names in the Republic of Ireland for 2011, I count approximately 30 of the top 100 boys’ names as “Irish” as against only 21 of the girl’s names. Oisín: That’s brilliant – much more entertaining than the usual insults. I wonder how far back they date. mollymooly: I think that qualifies as a significant divide. Thanks for the direct link; the lists are very interesting to browse. 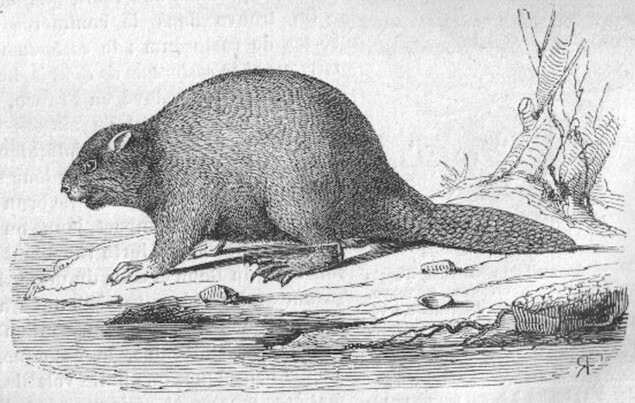 I haven’t been able to find out when the beaver was extirpated from Ireland; some sources say it never existed there at all. Do you have any references? that the Gaels were not familiar with the animal in Ireland, that they found it in Scotland on their arrival there, and that they borrowed a name from the native Pictish inhabitants. Uncertain, then, but I’m leaning towards doubt now. Edward: Oh yes: aptronyms, Wordsworth being a famous example. You might enjoy browsing Wikipedia’s list.